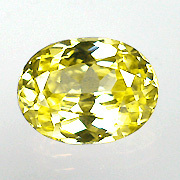 Bright golden yellow zircon from Tanzania. AGL cert. Measurements:	12.48 x 9.43 x 5.66 mm.